Not long ago, the average wedding dinner came with just one simple choice: meat or ﬁsh? Oh, how times have changed. Today, wedding receptions can be complicated affairs, requiring couples to account for virtually every dietary restriction imaginable. Curating the perfect menu to satisfy everyone—from your gluten-free cousin and lactose-intolerant aunt to your vegan, vegetarian, and pescetarian friends—can be a serious challenge. 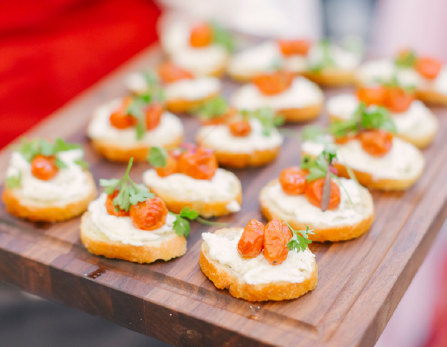 To help you navigate all those dietary demands, we tapped Meg Walker of Made by Meg and Lauren Keoppe of Antonia Lafaso Catering, two all-star caterers who know what it takes to keep everyone on your guest list happy—not hungry. 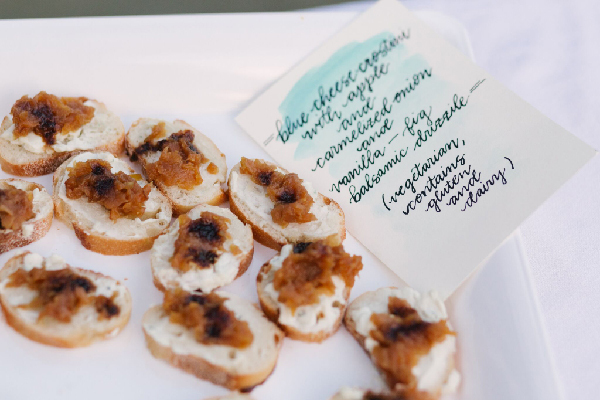 Here, the menu mavens share their top tips for a crowd-pleasing reception. First things ﬁrst: Decide how much a special menu matters to you. Catering to the dietary needs of your guests—even your lacto-ovo vegetarian sister-in-law—may seem like a no-brainer, but what happens when you and your fiancé are the ones with the special diets? Things get a lot more complicated when a couple of vegans have two families packed with meat-eaters. Before you start picking appetizers, determine just how much impact your (and others’) dietary needs should have on the menu. If your diet is linked to a larger lifestyle or world view—as veganism and vegetarianism often is—it's understandable that you’d want to honor your beliefs on your big day. Then again, Serving a room full of carnivores an entrée of eggplant parmigiana might be more trouble than it's worth. That's why many couples approach their reception the same way moms-to-be approach their baby showers: Just because they can’t enjoy toasting their momentous occasion with a glass of bubbly, doesn’t mean their guests have to go dry, too. 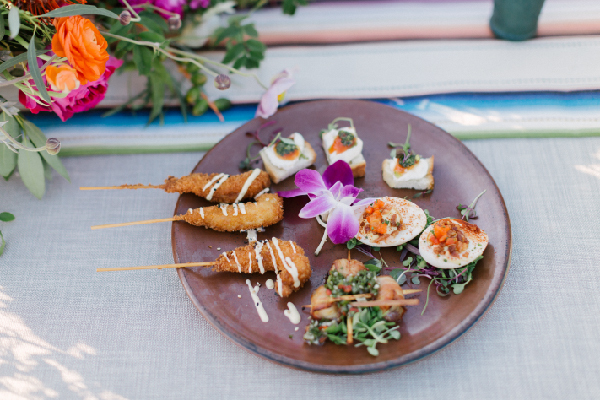 Ultimately, having meal options that satisfy all guests means there are no awkward conversations to be had on your big day—and, more importantly, no hangry guests. As more and more dietary requirements and allergies have become a part of our everyday lives, simple checkboxes on wedding invitations have become obsolete. Adding a “dietary restrictions?” line on your invitation allows guests to note anything—and everything—whether they are simply vegetarian or a lactose-intolerant vegetarian with a peanut allergy. (This format also ensures that your carnivorous friend who happens to be gluten-intolerant won’t end up disappointed by a vegetarian meal.) To ensure that everything is accounted for, you may also choose to include a sample menu with your invitation, along with a note that asks guests to respond if they spot something that might be an issue. Like a comfortable pair of heels, a ﬂexible caterer is truly invaluable to the enjoyment of your wedding reception. If accommodating diverse diets and allergies is a big part of your menu-planning process, finding a catering team with the right experience and know-how is vital. To be sure your caterer is up to the task, make sure to ask the right questions. Does the chef have any vegan or vegetarian recipes that are proven hits? Do they have tried-and-true recipes for all of the gluten-free friends in your life? What about dishes that accommodate nut allergies? Most caterers should be prepared for these queries, even if they pop up on the day of the ceremony. 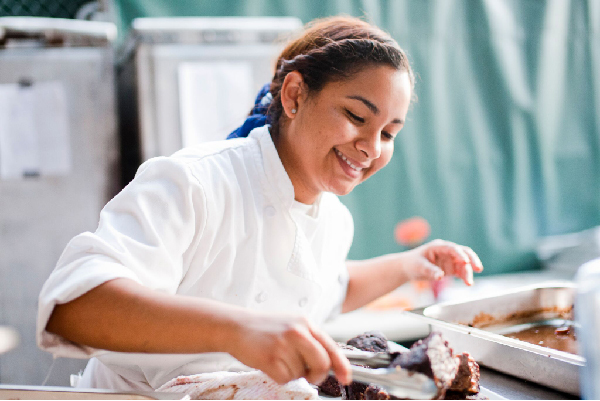 Of course, giving your culinary crew as much informationas early as possiblewill be key to making sure everything runs smoothly—and deliciously—on the day-of. Can’t seem to juggle all those conﬂicting dietary restrictions? Look to the buffet table. It’s the quickest way out of catering confusion—and the ultimate shortcut to a crowd-pleasing culinary lineup. Grouping different foods into their own well-labeled, separate sections ensures that everyone knows where their fork belongs, and saves you the trouble of creating a laundry list of preferences for your caterer. To make sure your buffet is stocked with dishes everyone will like, make your tasting a group affair. Bring along a few friends or family members with dietary restrictions to get a better sense of how dishes and ingredients you may not be familiar with should look and, more importantly, taste. Everybody leaves room for dessert at a wedding. So, if you know a large portion of your guests won’t be able to enjoy a traditional wedding cake in all of its gluten- and dairy-filled glory, consider adding a few other options to the menu. You can go all-out with a varied desert table that includes something for everyone, or opt for one smaller gluten-free or vegan option that compliments your show-stopping main dessert. Your guests will thank you for spreading the sweetness!